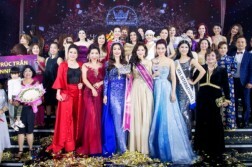 Women Leaders International Forum is an annual event held in March by the Women Leaders International Network (WLIN) under the direction of Vietnam Chamber of Commerce and Industry (VCCI). During the past 4 years, the Women Leaders International Forum has gained a lot of great reputations in the local and international business community and has proved the vision of women in the new age – They can rise and assert themselves as leaders. Positive effects of a meaningful event. The program has received a warm welcome and participation from a wide range of women leaders and professionals in many fields all over the world, from economic – political to medical – cultural – social sectors. Therefore, each issue mentioned in the forum has been analyzed and discussed in various perspectives, thus, it provides a comprehensive picture of interesting topics such as: “Women leadership in business”, “Young Women Leadership – Successes and Challenges”, “Leadership without borders “, etc. In addition, the forum also gives an opportunity for female leaders to freely share their opinions and experiences about the “Soft power” that women entrepreneurs need to achieve in order to adapt and integrate with the ever-changing modern economy, such as “Soft power in the media”, “Soft power in discussion and negotiation”, “Era of knowledge economy”, etc. Era of globalization has observed the rise of women participate in various fields such as economics-politics-trade-diplomacy and so on. Women have more and more opportunity to improve their career and become excellent leaders. In addition, women have also played an important role in innovative entrepreneurial activities, especially within the fourth industrial revolution when every step must be taken action fast and continuously in the attempt of catching up the world’s general trend. By 2018, to catch up with the changing trend of the world under the influence of Industrial Revolution 4.0, this year’s talk show will discuss about the topic: “Women Leaders and the Digital Economy”. 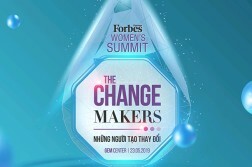 This program is an opportunity to hear the inspirational sharing of successful female leaders from all over the world. 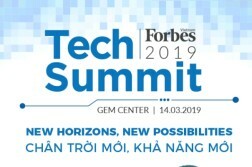 They will share how they overcame “the storm of challenges” called Industrial Revolution 4.0 and methods to rise and become the market leaders when they successfully applied digital technology platform. This year’s theme promises to definitely bring a heated debate on the stage for the Women Leaders International Forum because, in today’s economic environment, 4th Industrial Revolution has played an important role. Leaders who want to develop their organization to higher level would depend heavily on the use of digital technology in their businesses. The biggest goal, which Women Leaders International Forum is aiming at, is to connect the network of global women leaders, to tighten the bonds of friendship, to remove barriers between nations in order to look forward to cooperate and develop the economy in the future. In addition, the program welcomes young entrepreneurs with innovative business ideas. This is also a great opportunity for young leaders to hear the sharing of experiences and ideas from the senior generation of women leaders. The talented women in the market will participate at the event as speakers to share with us the story of their success. It is also a motivation, a living inspiration to break the old psychological barriers that women cannot have leadership in society. The special feature of the “Women Leaders International Forum” in recent years is the Top 50 Asia-Pacific Women Leaders Awards for their contribution in the process of asserting the image and positions of female leaders in the new era. This year, the Honoring Ceremony of Top 50 Asia-Pacific Women Leaders Awards will continue to be the highlight of the event with the given criteria. 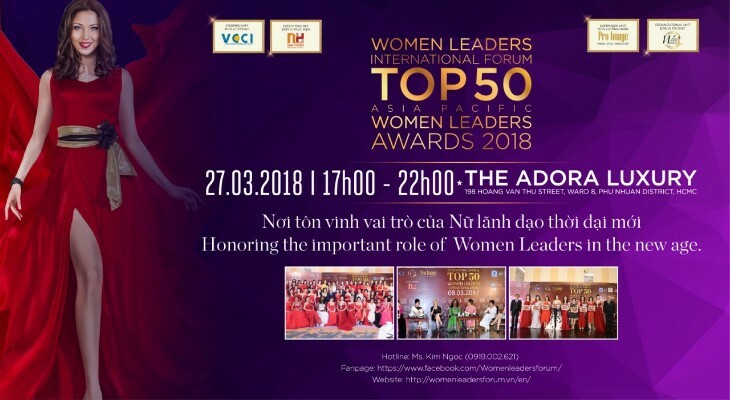 Women Leaders International Forum 2018 will be taken place on 27th March, from 17:00 to 22:00 at Adora Luxury (198 Hoang Van Thu Street, Ward 8, Phu Nhuan District, HCMC).